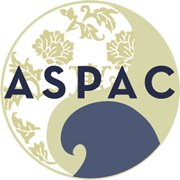 The name of this association is Asian Studies on the Pacific Coast Conference (hereinafter ASPAC). To provide a public forum for the communication of research and scholarship on Asia, by means of an annual conference to be held each summer, normally within the geographic region served by ASPAC, loosely recognized to be western North America extending to the International Date Line. By means of a newsletter, journal, or such other publications and programs as may be feasible for the association to undertake, to facilitate exchange of information among persons interested in Asian studies, to disseminate research results, and to further educate the general public about Asian affairs. Membership in ASPAC is open to any person interested in Asia. The classes of membership shall be determined by the Board of Directors. Any person interested in Asian studies may become a member of ASPAC by payment of the registration fees to the annual conference. The year of membership shall last until the convening of the next annual conference, at which time membership may be renewed or dropped without prejudice to future membership. At the discretion of the Board of Directors, students and retired persons may be enrolled as members at reduced rates. Such members enrolled at reduced rates shall have the same rights and privileges as other members. The Secretary shall maintain a list of the names and addresses of all persons paying conference registration fees, which shall constitute the membership roster of ASPAC. The membership roster shall not be used, in whole or in part, by any person for any purpose not associated with ASPAC, except by express permission of the board of directors. A member of ASPAC is not, as such, personally liable for the debts, liabilities, or other obligations of ASPAC. The ultimate authority of ASPAC shall be vested in the membership and shall be expressed through the annual meeting or, in special circumstances, through mail polls of the membership. The annual membership meeting shall receive reports from the Board of Directors, shall elect the Officers and Directors of ASPAC, and may adopt general policies and act on any other business brought before it. The membership meeting may amend these Bylaws under Procedures specified in Article IX below. Under normal circumstances, ASPAC shall hold an annual conference in the month of June and usually in cooperation with an academic institution within the AS PAC region as defined in Article II, Section 2. The annual conference shall consist of a planned program of scholarly papers, panels, and discussions, as well as a business meeting. The business meeting shall constitute the annual membership meeting for members of ASPAC. Notice of the annual conference including the Annual Business Meeting shall be widely disseminated via the internet and other appropriate means not less than sixty (60) days before the date of the meeting. A quorum for the annual membership meeting shall consist of one-third (1/3) of the persons who have registered and paid conference dues for the annual conference of which the membership meeting is a part. In the event that a quorum is not achieved, the actions and recommendations of the Board of Directors shall be adopted by the annual meeting. Except as otherwise provided in these Bylaws, the membership meeting shall transact its business by simple majority vote of the members present at a duly held meeting at which a quorum is present. Each member is entitled to one vote. Voting may be by voice vote, unless any member, seconded by another, moves for a written ballot. The annual membership meeting shall be presided over by the President or, in his or her absence, the President-elect, or in the absence of both these persons, by an individual selected by the Board of Directors. The Secretary shall record the minutes of the meeting, provided that in his or her absence, the presiding officer shall appoint another person to act as Secretary of the meeting. Meetings shall be governed by the latest edition of Roberts’ Rules of Order insofar as such rules are consistent with these Bylaws, with the Articles of Incorporation of ASPAC, and with provisions of law. The officers of ASPAC shall be a President, a President-Elect, a Secretary, Treasurer, the ASPAC representative on the national AAS Council of Conferences, the editor of E-ASPAC, the chairperson of the annual conference, and the immediate past president. The President and President-Elect shall be elected for a non-renewable two-year term. Both the Secretary and Treasurer shall be elected for two-year terms, renewable to a total of six years. The Conference Chairperson shall be appointed annually by the Board of Directors. The editor of E-ASPAC shall be appointed by the Board of Directors and serve at the pleasure of the Board of Directors. The ASPAC representative to the COC shall be elected by the procedures and for the term specified in the Bylaws of the AAS. The immediate past president shall serve a term concurrent with his/her successor. The Board of Directors shall be comprised of fifteen (15) voting members: the eight (8) officers named in Article V, Section 1 above, and seven (7) directors-at-large, four (4) of whom shall be elected each year by the members at the annual membership meeting to two-year terms, so that their terms are overlapping. The immediate past conference chairperson shall serve a term of one year. Individuals serving in multiple capacities shall nevertheless have a single vote. Subject to provisions of California law, the Articles of Incorporation of ASPAC, these Bylaws, and the general directives of the membership, the Board of Directors shall conduct the affairs of ASPAC and shall have the authority to execute on behalf of the association all powers and functions of ASPAC. consider such other matters and undertake such other actions as it deems necessary for the good of the association. The Board of Directors shall meet at the time and place of the annual conference and may meet at other times when necessary. The President shall preside at Board meetings and the Secretary shall record the minutes, provided that in his or her absence the presiding officer shall appoint another Director to record the minutes. A quorum shall consist of a majority of the Directors then serving. The Board shall transact its business by majority vote of those present. Any action required or permitted to be taken by the Board of Directors may be taken without a meeting, if all members of the Board shall individually or collectively consent to such action. A vacancy occurring for whatever reason on the Board of Directors, including a vacancy in any office, shall be filled by appointment by the majority of the remaining Directors to serve out the remaining term of the officer or director replaced. A Director may resign by giving notice to the President or Secretary. No Director may resign if ASPAC as a corporation would be left without a duly elected Director or Directors in charge of its affairs, except upon notice to the Attorney General of the State of California. The Board of Directors, upon the concurrence of a majority of its members, may remove from the Board any member, with or without cause. The Directors shall not be personally liable for the debts, liabilities, or other obligations of ASPAC. The Officers and The other Directors of ASPAC shall serve without compensation, except that they may be reimbursed for reasonable expenses incurred in the course of performing their duties to the association. The President is the chief executive officer, responsible for coordinating the business of ASPAC throughout the year. Prepare any annual or other reports requested by the national AAS, such reports to be made available to any member on request. Assume the duties of the President for the remainder of his or her term in the event of death, resignation, or incapacity of the latter. The Secretary shall perform the duties and functions that are associated with the office of secretary­ of an organization, including the timely filing of all reports to federal, state, and local government authorities. The Treasurer shall see that ASPAC funds are deposited in a bank or other appropriate depositary institution and shall disburse funds of ASPAC as authorized by the Board of Directors or the President, provided that all checks shall be signed by the Treasurer. The representative to the Council of Conferences shall act as general liaison between ASPAC and AAS and shall be responsible for keeping ASPAC apprised of AAS matters bearing on ASPAC, and for representing the interests of ASPAC within the Council of Conferences. The activities of the COC representative, however, shall in no way preclude appropriate dealings with the national AAS by any officer or member of ASPAC. The Council of Conferences representative shall “cc” the ASPAC President and at least one other member of the board with all electronic communications from AAS. The general editor of E-ASPAC shall establish an editorial board and guidelines for the selection of papers for publication and be responsible for the publishing those papers selected from the preceding year’s annual conference. Returning to the Treasurer within three months of the close of the conference any funds advanced by ASPAC as seed-money for conference expenses, together with any funds remaining to the annual conference after all expenses shall have been paid. The immediate Past President shall serve as archivist/historian and maintain the history of ASPAC document. The duties of all officers and directors shall begin at the conclusion of the annual conference at which they were elected. The committees of ASPAC shall include a Nominating Committee and such other regular and ad hoc committees as the Board of Directors may choose to establish. Except for the Nominating Committee, the Board may delegate to the President the appointment of committee members, and the power to appoint and remove committee chairpersons. Members of all committees shall serve one-year terms and shall be eligible for reappointment. The Nominating Committee shall be appointed by the Board of Directors and shall consist of three members, at least one of whom shall be a member of the Board. The Board shall designate the Committee Chairperson. The Nominating Committee shall annually prepare a list of candidates for elections to ASPAC offices. The list shall be given to the Board of Directors for consideration prior to presentation by the Nominating Committee at the annual membership meeting, at which time nominations shall also be invited from the floor. Anyone who is nominated from the floor must be present at the annual membership meeting so that assent is given to serve if elected. In preparing the list of candidates, the Nominating Committee shall consider such criteria as geographic and disciplinary distribution; representation of the character of ASPAC membership in terms of institutional affiliation, ethnic origin, gender, and age; and the competence, experience, and availability of individuals. the approval of any action which, under law or the provisions of these Bylaws, requires the approval of the membership of ASPAC. By a majority vote of its members then in office, the Board of Directors may at any time revoke or modify any of the authority so delegated. The Executive Committee shall keep minutes of its proceedings, and report to the Board from time to time as the Board may require. The fiscal year of ASPAC shall begin January 1 and end December 31. These Bylaws may be amended by two-thirds (2/3) vote of the members at the annual membership meeting at which a quorum is present. Proxy ballots may be used by those not in attendance by direct communication with the Secretary. Amendments may be proposed by the Board of Directors or by a petition signed by ten (10) ASPAC members. In the case of amendment proposals by petition, the proposed amendment must be submitted in writing to the President at least sixty (60) days before the annual membership meeting. The text of amendments proposed either by the Board or by petition shall be made available to the membership along with a proxy ballot prepared by the Secretary at the time of registration and payment of conference fees at the annual conference site. The property of this association is irrevocably dedicated to non-profit purposes and no part of the net income or assets of this association shall ever inure to the benefit of any Officer or member thereof or the benefit of any private person. In the event of the dissolution or this association, which is herein defined as a decision of two-thirds (2/3) of the Board of Directors to terminate operations as subsequently ratified by a majority vote of the members drawn from a list of the three previous years’ annual conferences, the assets of ASPAC remaining after the payment of all debts and liabilities shall be distributed to a nonprofit fund, foundation, or corporation of similar purposes and goals which has established its tax-exempt status under Section 501 (c) (3) of the Internal Revenue Code. Note: This is the bylaws as revised at the 2007 meeting.